Commentary: Has Our Romanian Nightmare Followed Us Here? Following the State of the Union address, I found the state of the nation surreal. I kept skimming past articles about the Democratic Party’s proposed economic stimulus packages, collectively known as the Green New Deal. They propose to fund unsustainable sectors like solar panels – which are already heavily government-backed – by targeting more self-sufficient industries, like meat production. In order to earmark raiding the cookie jar of productive businesses to fund those that aren’t paying for themselves, Democrats have to demonize the target in order to implement punitive measures such as meat taxes. I know the Green New Deal is based on non-truths and artfully doled misinformation, like the deforestation myth, but most people believe we are losing forest land in this country to the meat industry. That’s one of the lies told to them by our leaders in order to take advantage of the public support and vote. They need a mob to rob. How did we get to this choke point of punishing meat consumption, as one NJ radical animal rights activist senator proposes, in the form of a tax? I think I recognize a pendulum swinging back at me. Mom and Dad left everything they had to bring me and my younger brother to the United States. In this country, I am able to experience freedoms such as shopping for food, owning material things, and starting my own business. But that independence comes with heavy financial costs due to already overzealous, arbitrary, and crippling rules and laws. As a matter of recent personal developments, I started making my own beef tallow-based cosmetic creams and decided to turn my products into a small business. This process is an ancient form of cosmetic production, and part of the reason I did this was to connect people to the truth. I saw the threat to US food sovereignty – the safest, freest, most abundant, most reliable food producer in the world – coming in the form of untruthful propaganda planted by special interests. It comes in the form of false environmental claims like the threat of cow flatulence or pig feces. Meanwhile, I work in NYC, and I see a different reality. Those urban-dwelling legislators blame cow and pig waste as they step over garbage on the street with plastic cups in hand. I see human waste in myriad forms coming from congested metropolises. The waste is in plain view walking past storefronts. Constant construction to remodel commercial spaces after every tenant swap is in plain view. NYC takes at least 45,000 construction applications annually. Think of all the garbage from ripping out floors, walls, and ceilings and replacing them 45,000 times per year. As city dwellers are packed in so tight in the street that they can’t traverse a sidewalk without bumping into one another like ants on an ant farm, we throw away more than 76 million pounds of garbage per day. Nine pounds per person per day of that waste is produced by people while at work. That’s a lot of to-go lunch boxes, cups, bags, and pulp from fresh juices. To what extent are the waste gases from discarded pulp considered agricultural waste? Will the Green New Deal Be a Death Blow to Budding Entrepreneurial Ventures? So far, I haven’t sold one item, and God forbid I do before all levels of government have been duly compensated for ensuring the safety and well-being of the people from the threat of me and my hand cream. The local health department wants to inspect my kitchen “to make sure that your dog isn’t walking around getting hair onto the product or that you prepare your product on the same counter as your chicken.” They want me to state that I am a chemist because their fee system is based on the number of chemists on staff. They will refer me for registration with the FDA to have my products tested and my work facilities investigated some more. There are fees associated here, too. The government can’t provide free public services for free. Naturally, the IRS will have to be notified and receive their dues. Now we may have a Green New Deal standing in line for my green, too. With children in tow, my parents escaped oppression and a lack of human rights – the right to pursue happiness and the right to own property. They also escaped government-controlled death by not having to wait for health care under a communist regime. Not for lack of resources, total government control in the name of the public interest – with no private business rights – kept everyone equally poor and longing for basic daily resources and comforts, like coffee, fruit, vegetables, meat, bread, dairy, cigarettes, clothes, fashion magazines, videos, and news. The populace that hadn’t yet died on the inside existed with the frustration of simply not being allowed to live normal lives. They faced the threat of punitive repercussions if they displayed any personal initiative or resourcefulness. Those consequences included regular government raids and confiscation of personal property. The people waited in line for rations of flour and their monthly maximum of sugar and cooking oil; the political members – ruling elites – feasted on the produce and sheep they plundered from the farmers and ranchers. Then they exported the rest. Romania was the breadbasket of Europe. But it was the black market that supplied the nonconformists and enemy-of-the-state families with the forbidden goods the paternal government deemed unnecessary for the people – smuggled American cartoons and Nutella for the kids and Russian black caviar for a birthday party or gathering to impress connections. They were the ones who risked getting shot at the border on their way out, for they wanted options for their children, who were considered the purview of the state – another resource to be plundered. Citizens were expected to remain and exist only to act as chattel for the benefit of the state. It was servitude for the good of the people. Socialism had already morphed into stage 4 cancer: communism. Fast forward 35 years plus 4,751.5 miles, and that nightmare hound is back to nip at the old couple’s heels, sending chills up their tired backs. It is certain that there is a power struggle over our American resources. Certain special interests have taken it upon themselves to seize control of our abundantly rich, productive, efficient, and privately-owned agricultural sector by demonizing farmers and ranchers, all as a means of prying control from independently productive family businesses. These nefarious wolves dressed in white are no gentle lambs. They aim to chip away at our personal freedoms in tiny increments until the entire foundation of the Constitution crumbles. The slobbering wolves in white are gaining ground by pulling the wool over our collective eyes with lies. They are salivating to plunder the world’s breadbasket. Make no mistake: they may blame cow farts, but when you have given them the ranchers, they shall dine on the same meat they have deemed illegal for you and me. They buy us with empty promises to enact unconstitutional laws that entrap others into giving more and to tax the bad ones for the common good, ultimately entrapping all of us in that same net. As soon as we make more, we are taxed more for more social services that don’t ever solve the problems. Socialism is a crabs-in-a-barrel system where the political elites stand outside, watching some crabs pull the others down and the others give up at the bottom. As a former refugee from communism, a New Yorker, and someone who is intensely appreciative of the producers who make our world possible – the farmers and ranchers – my aim is to use a small business to connect urbanites with the natural perfection of the raw resources normally out of reach to them. But the Green New Deal would tell them I’m evil and shouldn’t be given the same free access to the market to compete. 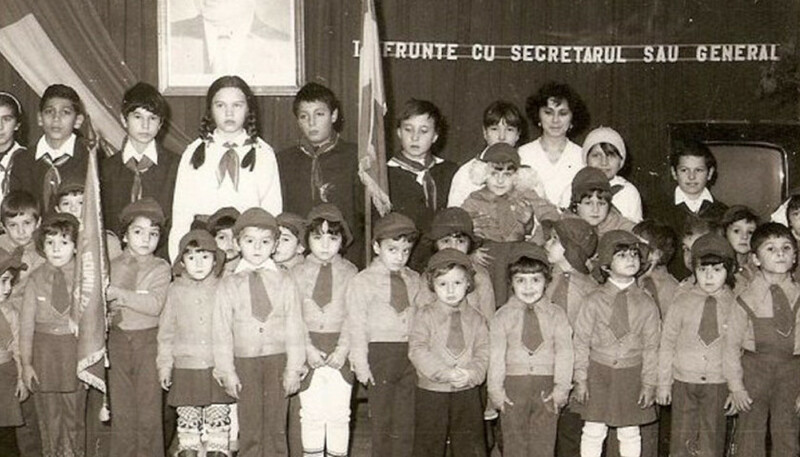 Back under the Ceausescu regime, my father was under surveillance by the secret police. He had dual citizenship and traveled freely, which merited him heavy government monitoring. Thanks to the mainstream emergence of extremist environmentalism, militant activists, doxxing, and extremist legislators, I can’t help feeling the pending threat of that hungry hound. Can my nice cow fat skin-creams make me a target here in the United States similar to what my dad endured in communist Romania? Andra Constantin is the enamored owner of an opinionated 20-year-old gelding, who has opened her eyes to the differences between animal welfare and the extremist ideology of animal rights. Photo “Members of Şoimii Patriei (Romania)” by G.B. CC BY-SA 3.0.